It couldn’t have been a more fitting anniversary gift. The John Molson School of Business emerged victorious at the twenty-fifth edition of its International MBA Case Competition, winning the coveted Concordia Cup and first prize of $10,000. The Université de Montréal’s Haute Études Commerciales took second place, and Germany’s Universität Münster won third. The winners were named at a banquet held at the Hilton Bonaventure Hotel on Jan. 7. JMSB team members Binh Nguyen, Jason Nelson, Ravindra Sharma, Ivan Soltero, Nasos Makriyiannis and their coach, Tim Field, jubilantly ran a gauntlet of wellwishers as they proceeded to the stage. One of them almost took a tumble amid the excitement. “I wanted to win from the beginning, and it’s amazing to have my wish come true. But I could have done without almost falling off the stage!” laughed Sharma. The victory marks the home team’s second win in the competition’s history. JMSB last won in 2004. Tim Field coached both teams during his six years as a faculty member. The University of Tennessee Knoxville and the Indian Institute of Management - Bangalore shared the Richard Outcault Team Spirit Award. The first-ever J. Pierre Brunet Coaching Award was given to Dr. Alex Faseruk of Memorial University of Newfoundland. It is awarded to the coach who best prepares his or her team and embodies the spirit of the competition. Pierre Brunet handed the award to his longtime acquaintance. Now retired, Brunet taught at Concordia for 30 years and has been both a coach and lead judge. Now he is on the competition’s advisory board. Participants past and present were at a gala held Jan. 3 at the Montreal Museum of Fine Arts to fête the competition. There, more than 400 participants, sponsors, judges and coaches, both past and present, packed the museum’s elegant glass terrace to sip cocktails, reminisce and peruse displays documenting the competition’s history. “This year is our most international yet, with four continents represented,” said main student organizer Anouk Bertner. More than 200 students from 36 countries participated. While there are usually four student organizers, a fifth was added this year. Organizers raise over a quarter of a million dollars from sponsors, find judges, cases and schools to participate. This is in addition to logistics, from the location and catering to the souvenir program. This year, there was an additional twist: “For the first time, we dealt with foreign governments to ensure competitors would receive their visas in time,” Bertner said. Participants from China’s Xiamen University were initially denied visas by the Canadian government. 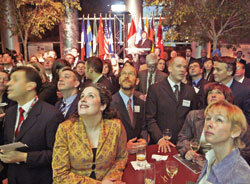 Organizers and university administration worked with the Canadian embassy in Beijing to iron the matter out, and the team was in Montreal in time for the opening. During the final evening, they and the other teams celebrated over a sumptuous dinner before hitting chic St. Laurent Blvd. The lively scene reflected a remark JMSB Dean Jerry Tomberlin made at the competition’s outset.